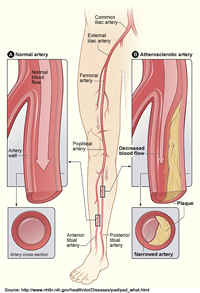 Peripheral Artery Disease (PAD) describes a condition or set of conditions caused by the blockage or narrowing of the body’s large peripheral arteries. Lack of proper blood flow to the legs is very common in this condition, with many patients experiencing leg pain with walking (claudication), which occurs as a result of the lack of oxygen to the muscle tissue. In some patients the vascular system may compensate for the reduced blood flow by forming alternative routes, called collateral vessels, which bypass the affected vasculature. In others, collateral vessels may not be sufficient resulting in foot pain at rest and non-healing sores on the feet. What are the symptoms of Peripheral Artery Disease (PAD)? What causes Peripheral Artery Disease (PAD)? Over time, smoking, poor diet, and inactivity, in conjunction with diseases such as hypertension and diabetes, cause the vein walls to become rigid and narrow. If PAD is suspected, your health care provider will perform a non-invasive test referred to as an ankle brachial pressure index (ABI). The ABI measures the difference between the systolic blood pressure in your arms and the systolic pressure in your ankles. Based on the result of this test, an ultrasound may be ordered to determine the extent of the blockage. Angiography, an x-ray dye procedure, or a Computed Tomography Angiography Scan (CTA) may also be used to more precisely define the exact location of the blockage if a procedure is indicated. The treatments for PAD focus primarily on risk factor reduction in conjunction with medical therapies. Surgical options are reserved for those patients who have the most severe symptoms and complications. Consider one of several medications specifically designed to treat claudication symptoms. For a minority of patients the above recommendations and treatments aren’t enough, and minimally invasive treatment or surgery may be needed. Angioplasty or stent placement (as is done in the heart for coronary artery disease (CAD) are nonsurgical and are performed by making a small incision through which a catheter is inserted to reach the blocked artery. A tiny balloon is inflated inside the artery to open the clog. A stent — a tiny wire mesh cylinder — may also be implanted at this time to help hold the artery open. Sometimes a medicine can be given through the catheter or a special device can be inserted through it to remove a clot that’s blocking the artery. Artherectomy is a procedure to remove plaque from the artery. If there’s a long portion of artery in your leg that’s completely blocked and you’re having severe symptoms, surgery may be necessary. A vein from another part of the body can be used to “bypass” and reroute blood around the closed artery. Your healthcare professional will discuss your options and help choose the best procedure for your situation.